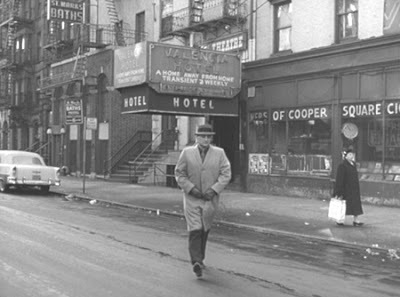 I've written about "Blast of Silence," Alan Baron's New York (slightly hokey) indie noir from 1961. In the background, you can see the former Saint Marks Russian and Turkish Baths ... which became the New St. Marks Baths ... then Mondo Kim's ... and eventually BarCade. I might be wrong, that scene by the bungalows looks like Hamilton Beach.